Tricia: Hi, Deb. Thanks for stopping by! Tell us a little about yourself. Deb: I live in Dunedin, New Zealand and I have a Postgraduate Diploma of Science in Zoology, from the Otago University (yes, Dunedin... as you can see, I get around). I have a two and a half year old son who LOVES to dance to Michael Jackson, Mahna Mahna and Pitbull; a husband who plays drums (very well) and hockey; a terrier who runs like a rocket; cats who... sleep; and a miniature horse who I don’t see enough because we don’t have the space to keep him at home. Tricia: Describe your writing process. Are you a plotter? Or do you write by the seat of your pants? Do you have a special place to write, or can you write anywhere? Deb: I’m a... plotster? I learned a lot while writing Healer’s Touch, so I know the value of outlining and having a story plan. I’ve tried to apply this to the next book, but I still find I like to “just write” most days. I flip between the two states, really. I write, and when I hit a snag I stop and brainstorm/plot. The overarching idea is pretty stable, it’s a matter of discovering the details. I write at the dining table. I have a desk, but it’s shoved in the corner of the dining room and, well, now it’s gathered all my filing I haven’t done... I can write anywhere if the silence is available (with a toddler in the house, that’s rare!). I achieve my greatest productivity when I slip out of the house and set myself up in one of the university’s libraries (I’m not a student anymore, so I don’t have access to internet there... it’s good to get away from distractions). I can do that once a fortnight or so. Tricia: Can you tell us about Healer’s Touch? Deb: It’s the tale of a girl finding her place in a dangerous world. Llew’s got it rough. She’s 17 and living on her own in a mining town suffering the effects of dwindling gold. The wealth is gone, only the hardy and downtrodden remain. She disguises herself as a boy to avoid the kind of trouble that comes looking for girls in such environments. On top of that, Llew can heal herself by taking life-energy from other living things, but her island nation abhors magic, as the two known magic races have been the cause of war on the nearby continent for centuries. When she meets a group of fighters escorting a young woman to her future husband on the continent, Llew seizes her opportunity for greater things... but her troubles are just beginning. Within the group is Jonas, a soldier uniquely gifted with the strength, speed and magic knife to ‘kill the unkillable’ - the healers. To add to her woes, Jonas’ jealous half-brother, Braph, is seeking Llew for the blood he would use to power the device that lets him perform magic; his goal, to defeat his brother in battle. Tricia: Where did you get the idea for the book? Deb: Right, well, it was a real step-by-step development. When I started writing it, I was writing to pass time at a mind-numbing job, not to create a novel. I was watching a lot of The Young Riders at the time, and so I set my tale in a wild-west styled setting. I populated it with a few characters that shared some characteristics with my favourites from the show. I’d taken up watching The Adventures of Brisco County Jr and was developing a slight interest in Steampunk (the mad inventor side of things, anyway)... and so Braph was born. Tricia: Which character is your favorite? Why? Deb: Hmm... It’s hard to pick. But I think I would have to say Anya, now. She doesn’t play a huge role in Healer’s Touch, unfortunately and, in all honesty, when I created her she was a tool – a purpose for a journey. Hardly a real character. But by the end of Healer’s Touch she was really coming into her own. She’s been brought up in a small town, groomed to be the wife of an important man. When she meets him, she finds a man willing to consider her his equal, rather than merely a trophy wife... and she blossoms. Most of this is evident in Warrior’s Touch (Book 2), but I think you get a sense of Anya growing in Healer’s Touch, too. Tricia: What was your biggest challenge in writing this book? a. Llew’s power. I nearly abandoned it a few times when I found it hard work dealing with the consequences. b. Braph. I wanted him to be powerful enough to pose a real threat to Llew and Jonas. It got a bit scary there for a while. Deb: Some of my favourites: Iain Banks, Diana Gabaldon, Brent Weeks, Joe Abercrombie, David Eddings... (I love more, but I’d say this group are the most influential as far as the types of stories I want to write go). Tricia: What are you currently reading? Deb: “The Blade Itself: The First Law – Book 1” by Joe Abercrombie (o: Haven’t read it before, thought I should see where he started since I’ve enjoyed his later works. Tricia: What projects are on the horizon for you? 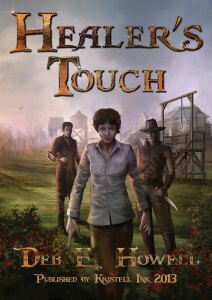 Deb: I’m currently writing “Warrior’s Touch”, with the plan for Book 3 to be titled “Magician’s Touch” (see what I’m doing there?). Jonas punched the tree again. Bark and blood flew; his skin wasn’t impenetrable. “Hey, Jonas.” Hisham slid from his horse and went to grab Jonas’ arm. But Jonas just swung even faster and harder – too fast for his friend. The tree creaked, and pain shot up his arm. He folded over, cradling the limb and shaking out his hand, all the while cursing profusely and stamping a foot. Jonas took a moment to breathe through his curses. Then he straightened, stretching and clenching the injured hand. He’d scraped his knuckles good and jarred his bones, but nothing was broken. He looked at Hisham, thinking he would just agree with his friend, climb back on his horse, and they would carry on. But when he looked up, all he wanted to do was punch something – someone – else, and Hisham didn’t deserve it. Jonas turned away, striding several frustrated paces, muttering, cursing Braph, cursing Turhmos, cursing himself for leaving Llew, cursing Llew for not just letting him be and staying put inside where she was safe, cursing Lord Tovias for not having an estate secure against Braph… He walked away from and back to Hisham several times, muttering and cursing, muttering and cursing. And finally stopped in front of his friend and puffed out a deep breath. Also available through Barnes & Noble, Kobo and various other outlets!